Now that the trailer of DJ is going viral all over, the latest news from the film is that a full on mass number is being canned on the lead pair currently in Hyderabad. A star choreographer is composing this song which will come as a highlight in the film. DSP has composed this rocking song which will once again be at the massiest best in Bunny’s career. The promotions of the film are in full swing and this particular mass number’s audio will be out soon. 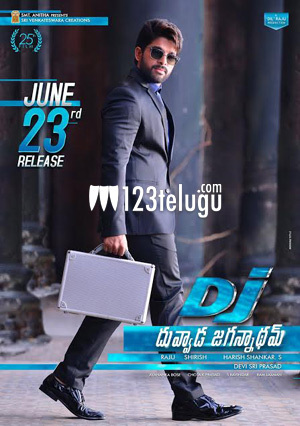 Bunny plays a very energetic role in DJ and his combination with Pooja Hegde has also been appreciated all over. Dil Raju produces this film which is his 25th project in his banner.